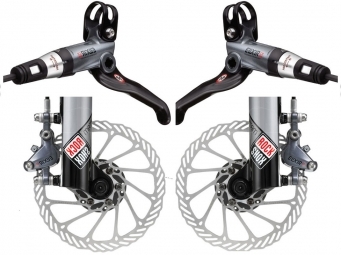 Pair of Avid Elixir CR Mag brakes discs 160mm/160mm 2010 + PM / IS All our brake discs are mounted, purged and ready to use, supplied with plates already mounted and a 2 year warranty. Elixir CR Mag 2010 Practice: Cross Country / Trail / All Mountain / Freeride / DH. Magnesium body / carbon lever / caliper Magnesium. . TaperBore technology / tool-free adjustment of the contact point and guard / two-piece caliper and pads by loading up / MatchMaker Compatible. Double piston system, open system. DOT 5.1. Weight: 710g the pair with adapters and disc 6 holes 160 mm Front Rear 355 g 355 g Hoses: front: 100 cm / rear: 150 cm Brakes F + R mounted purged and ready. Comes with discs, screws, Bracket original postmount, IS adapter front and rear Platelets and instructions in their original box.